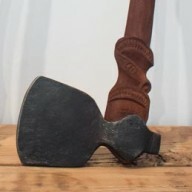 Blacksmith Robert Pinkney and carver Michael Matchitt have combined their talents to produce a series of ‘Trade Axes’ similar to ones used as exchange goods between Pakeha and Maori during earliest European contact in Aotearoa/New Zealand. 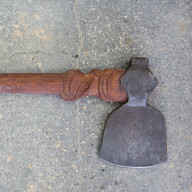 Captain Cook is believed to have traded axe-heads with Maori and successive arrivals of explorers, whalers, early settlers and missionaries increasingly brought hafted axes specially manufactured for the purpose of trade. 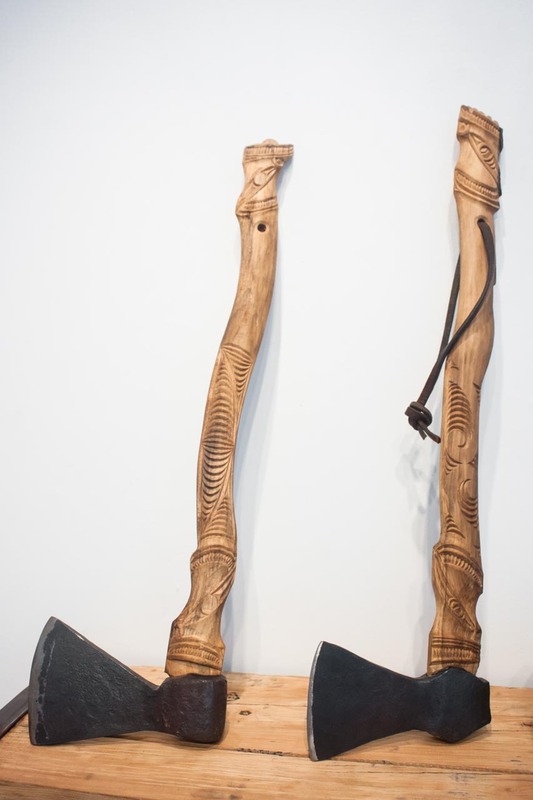 Prized both as implements and later as weapons Maori decoratively carved the handles to personalize them. 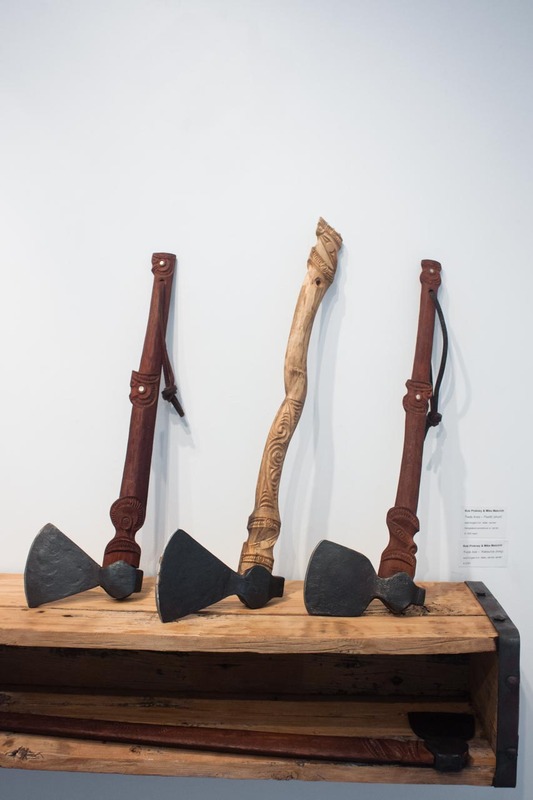 Rob Pinkney, a trained blacksmith who was born and raised in Kohukohu, Hokianga, has based his six axe-heads on trade axes that were mass produced in Europe. 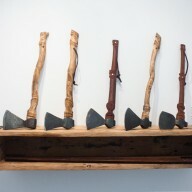 Five are English styles with curved blades and one a French design with straighter cutting edge. 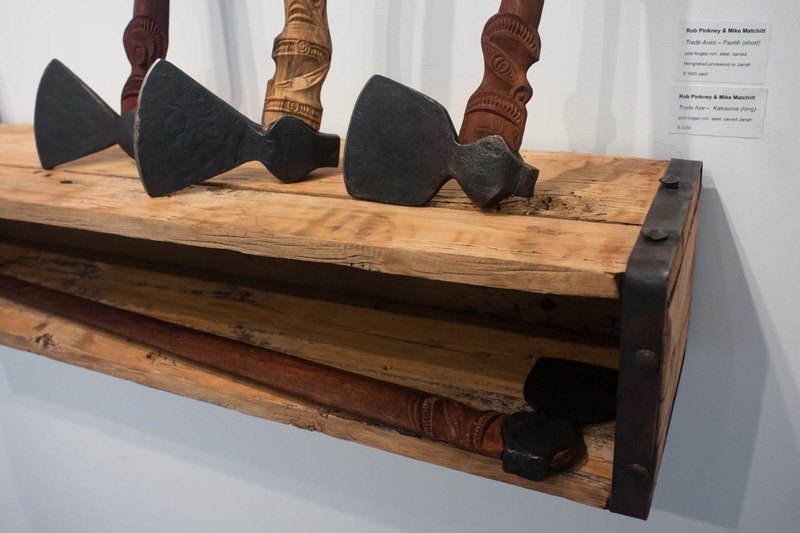 The axe-heads created by Rob come to life when combined with wooden handles fashioned by Michael, each a hand-carved contemporary artwork blending traditional surface patterns and using materials available to early Maori. 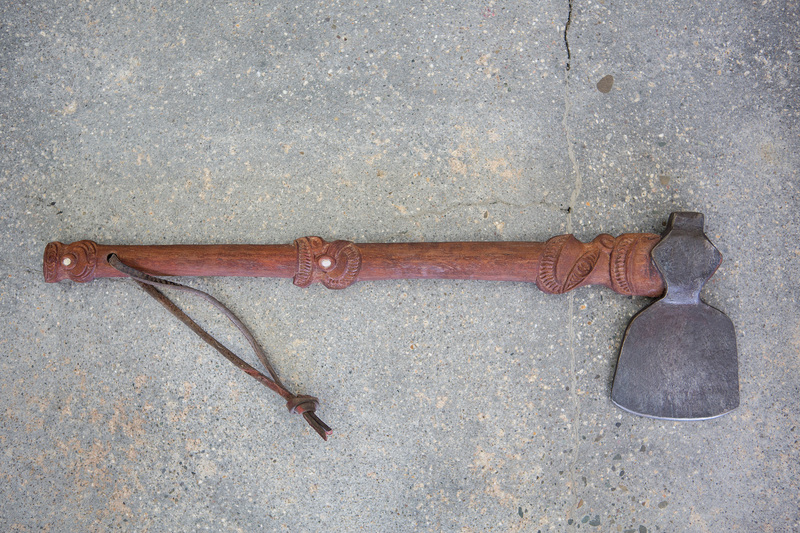 Michael explores handle shapes other than customary straight ones, his paatiti (short handled axe) and kakauroa (long handled) being a little longer than traditional trade axes. 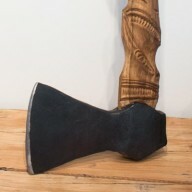 Michael uses Hongoeka (Lancewood) and Jarrah to enhance the heads forged by Rob. 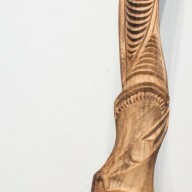 Michael, who comes from a long line of traditional Maori carvers, trained at Te Puia (NZ Maori Arts and Craft Institute) and has taught traditional carving in schools around the country, is always interested in creative collaboration. 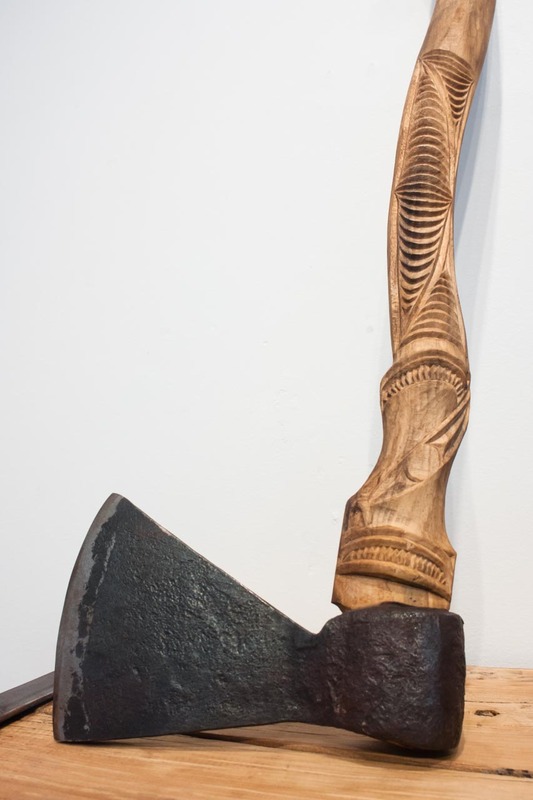 Working together as Maori and Pakeha, each in their traditional role, Michael Matchitt and Rob Pinkney aim to highlight the positive relationship of our cultures in Aotearoa/New Zealand and also salute an important implement in early Pakeha-Maori interactions, the Trade Axe. 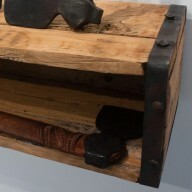 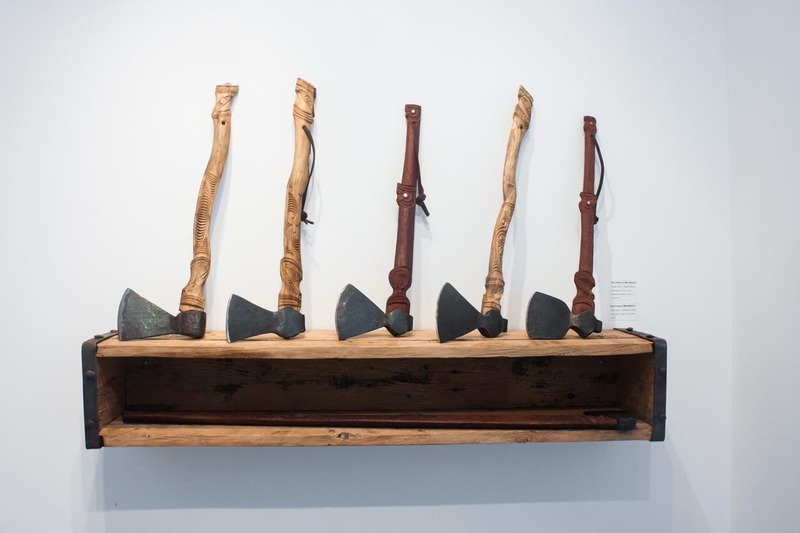 The inaugural exhibition of these Trade Axes in Village Arts gallery Kohukohu, Rob’s ‘home gallery’, is from 13 June – 23 July, the perfect compliment to Jennifer Ashton’s talk “At the Margin of Empire” about pioneer timber trader John Webster, happening at 2pm Saturday 13 June.